Former Army officer Colonel Tim Collins has said he wants to become one of the new elected police and crime commissioners in England and Wales. Col Collins became known for a stirring eve-of-battle speech to his troops in the Iraq War in 2003. He has applied to be selected as a Conservative police commissioner candidate, and is reported to want to head the force in Kent. The first elections for the posts will take place in November next year. Col Collins told the Sunday Telegraph he was inspired by the achievements of former New York mayor Rudy Giuliani, who reduced crime through tougher policing. "This is a job for someone energetic and who is willing to work with the chief constable," Col Collins said. "It is important that it doesn't become just a talking shop for knackered old policemen or a sunset gig for some trough-loving councillor." 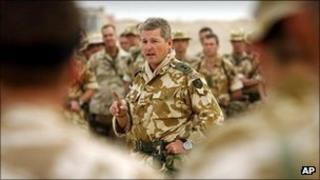 He was made an OBE after making a rousing speech to his troops in Kuwait as they prepared to invade Iraq in March 2003. In May, Home Secretary Theresa May said the government would press ahead with proposals for directly elected police commissioners in England and Wales despite an unexpected defeat in the House of Lords. The plan for the commissioners, which would replace elected police authorities outside London, is one of the government's flagship law and order policies. Critics have warned that the plans could do "irreparable damage" to the police service by putting too much power in the hands of one person.